Dalton operates cGMP manufacturing facilities at its Toronto, Canada location. The facilities underwent a significant upgrade and expansion in 2016, including the reconstruction of the sterile filling suite with new HEPA systems, and fill line RABs, new WFI system, new vial washing-depyrogenation capabilities, as well as improved material and personnel flows. 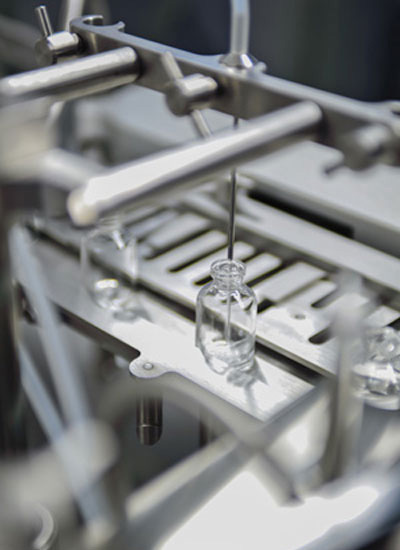 The environmental conditions within the GMP Manufacturing Facility, including temperature, humidity, air pressure and air quality are monitored at regular intervals. Access to the GMP Manufacturing Facility is restricted to authorized personnel and is controlled by an access card system. The suites were designed for the production of APIs. Each GMP Manufacturing suite is fitted with stainless steel tables, an 8-foot walk-in hood and a 6-foot bench top fume hood. Terminal HEPA filters are located throughout the ceiling to maintain air quality. The walls, ceiling, and floors are finished with a highly durable epoxy based coating to maintain a high level of cleanliness. The manufacturing suites have a Grade C classification. A GMP Aseptic Filling area was originally constructed during in 2001. This area is approximately 300 square feet (28 square meters) in size and is constructed with a cleanable modular wall system. The area contains a material air lock, a personnel airlock for gowning and for compliant material and personnel flow. The fill line, which is under Restricted Access Barrier Systems (RABs) has a localized Grade A environment. There are terminal HEPA filters located in the ceiling. Pressure, temperature and humidity are all monitored continuously through Dalton's Building Automation System. A full environmental monitoring program is in place for the GMP area. Located in the GMP area, this room provides a localized Class A environment for all clean items being removed from the autoclave. The autoclave was installed in 2001 along with several pieces of process equipment including a pure steam generator, plant steam boiler and a RO/DI purified water system. The input side of the autoclave is located in the GMP Equipment/Glass Wash Area. Dalton installed and qualified a new Steris WFI system in 2014 to support the operational needs of the GMP production areas including the new vial washing and depyrogenation room. The WFI system is compliant with U.S., EU and Canadian requirements. Dalton operates a commercial manufacturing suite for the production of oral powder filled capsules. The capabilities include a fluid bed dryer, blending and encapsulation capabilities. This 100 square foot (9.3 square meter) room segregates the sampling of solvents and other raw materials for cGMP. This room features a fume extractor arm and stainless steel benching for work space. 100 L and 250 L glass reactors. Building Automation System (BAS), which continuously monitors temperature, humidity and pressurization in all laboratory areas. In addition the system monitors the higher hazard areas of solvent storage and the hydrogenation room in case of solvent leak and/or fire. Security system with proximity card access to critical areas. The GMP facility also has additional security cameras for observation purposes. Over 6,000 square feet (557 square meters) of technical writing areas, administrative and management offices. Separate shipping and receiving bays located in rear of facility ensuring smooth intake of materials and output of product.